The epitome of American comfort food with apples, cinnamon, walnuts and white bread. Combine 1 cup bread flour, yeast, salt, and sugar in a large mixer bowl; mix on low speed with a paddle attachment until incorporated. Heat water, milk and butter until very warm (120-130°F). Add warm milk mixture to flour mixture and mix until combined. Add remaining bread flour 1 cup at a time, mixing just until combined. Switch to a dough hook, and knead dough for 5 minutes until smooth and elastic (if dough is sticking, add additional flour, 1 tablespoon at a time. The dough is ready when smooth and tacky (dough will stick to the finger, then release). Placed dough in lightly oiled bowl and turn to grease top. Cover; let rise until dough tests ripe. Turn dough onto lightly floured surface; punch down to remove air bubbles. Divide dough into 2 sections. Let rest 10 minutes. Prepare filling: Combine sugar and cinnamon in small bowl. Roll or pat each dough into a 12x8-inch rectangle. Brush one dough with melted butter; sprinkle with half of cinnamon mixture. Place half the apple pieces and walnuts evenly over dough. With a rolling pin, push apples, walnuts and cinnamon sugar lightly into the dough. Roll dough tightly, starting with the short (8-inch) end; pinch edges to seal. Repeat with the second dough. The dough is very soft and sticky. Carefully lift and place pieces into greased 8½ x 4½-inch loaf pans. Press dough to fit pan, and smooth top. Cover; let rise until almost double in size, or until indentation remains after touching. Bake in a preheated 350°F oven for 35-40 minutes, until golden brown. Place a tented piece of aluminum foil over breads during the last 15 minutes to prevent over-browning. Remove from oven after baking and brush tops of loaves with remaining melted butter. Remove from pans; cool on wire rack 10-20 minutes. Combine glaze ingredients; drizzle on loaves. Is it possible to show a picture of the finished product, before cutting? 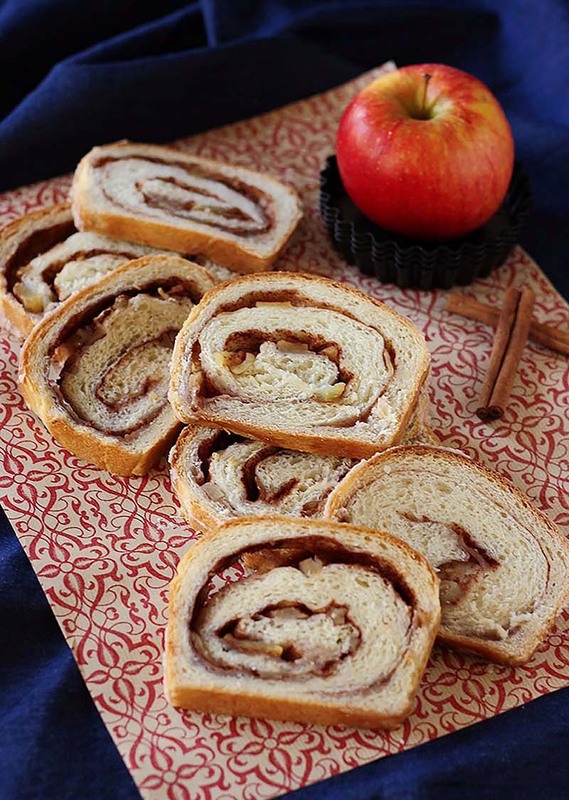 You can find a picture of the finished, uncut loaf here: http://tutti-dolci.com/2013/09/apple-cinnamon-walnut-bread/. Make sure to knead the bread after the first rise otherwise you get dry non stuck together bread.